Only elected leaders by people rule the country. People have freedom to express views, freedom to organize and freedom to protest. The world map given here shows democratic governments from 1900 to 1950. 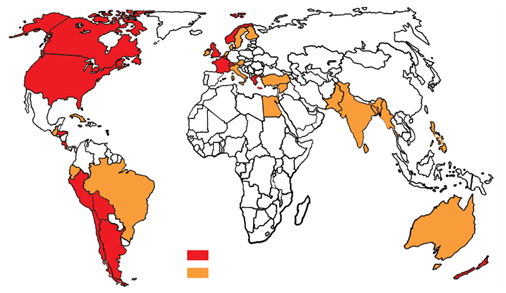 The countries which are shaded in red had already become democracies before 1900. 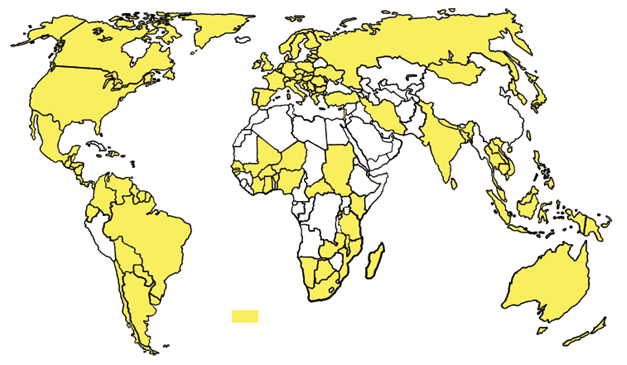 The countries shaded in yellow became democracies between 1900 and 1970. This world map shows democratic countries in 1975. 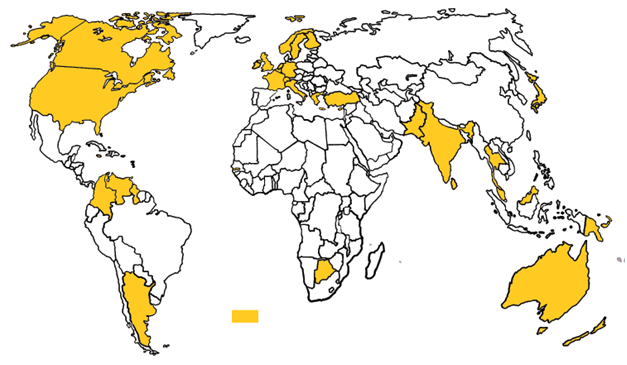 Compared to the earlier map, the number of democratic countries has increased in this map. This was mainly because of freedom of many countries from colonialism. The end of colonialism resulted in the birth of many new nations during this period and many of them preferred for democratic rule. This world map shows democratic countries in 2000. It can be said that most of the countries became democratic by this period. Collapse of the Soviet Union in the 1990s and subsequent collapse of communist regimes in Eastern Europe and many other parts of the world led to rise of democracies around the world. This map also shows that a major portion of Africa is yet to embrace democracy. Additionally, China and some central Asian countries are the regions where democracy has not taken roots. The process of democratization began with the French Revolution in 1789. It took about 100 years of struggle for France and many other European countries to develop into proper democracies. The process of democratization of Britain began much earlier than in France. It was a comparatively peaceful process. The British colonies in the North America declared their independence in 1776 and established democratic regime. Hence, USA is known as the oldest democracy in the world. The USA adopted its democratic constitution in 1787. Many changes took place during Europe’s struggle for democracy. It took many years of constant struggle to secure universal adult franchise. New Zealand was the first country to grant voting rights to women. Early democracies were established in North America, Europe and Latin America. The colonialism was beginning to end after the end of the Second World War. Many colonies became independent within a short period after the Second World War. India was one of them. While India continues to be a thriving democracy, many former colonies experience various ups and downs. Military coups became the norm in many former colonies and democratic regimes were overthrown by dictatorial regimes, e.g. Ghana, Pakistan, Myanmar, etc. The next big push for democracy came with revival of democracy in many Latin American countries; like Chile. The collapse of the Soviet Union further accelerated this process. Communist regimes in many countries came to an end and paved the way for democratic regimes. At present, more than 140 countries have multi-party democracies. There are certain issues which do not come under the purview of a country or even under a small group of countries. These issues are discussed and resolved at various international forums. United Nations is a world organization which makes convention on international law, security, global cooperation and social equality. The UN Secretary General is its chief administrative officer. Important issues on international security are discussed and resolved by the UN Security Council. The International Monetary Fund (IMF) and the World Bank lends money to governments as per the situation. These organizations are association of different countries. Initially, they came into origin because of initiative of the developed and powerful countries. The power equation in these organizations depends on the relative amount of fund received by a particular country. Since USA is the largest contributor of funds, hence it enjoys the maximum power. There are times when a decision made by the world bodies may not be democratic at all. The UN Security Council has 5 permanent members and 10 temporary members. The 10 temporary members are elected by the General Assembly for two year term. The permanent members enjoy veto power in the Security Council. There are many examples of misuse of veto power by the permanent members. The International Monetary Fund presents the same situation. More than 52% of its votes is contributed by 10 member countries, viz. US, Japan, Germany, France, UK, China, Italy, Saudi Arabia, Canada and Russia. The World Bank has a similar system of voting. The President of the World Bank has always been a US citizen and is nominated by the Treasury Secretary of the US government. Many democratic regimes in the world believe in promoting democracy so that remaining non-democratic regimes should change. While the idea of promotion is very good, some countries have tried to enforce democracy in some other countries. The case of Iraq is a good example. It was ruled by the dictator Saddam Hussein. Although he earned bad repute because of annihilation of his political opponents, we should not forget that he gave liberties to women and pupil during his rule. USA attacked Iraq on the pretext of finding the weapons of mass destruction and for establishing a democratic regime. Saddam Hussein was finally captured and tried for several offences. An interim government of US’ choice was installed in Iraq after that.